The EVO Cantilever Chair incorporates the contemporary design. Chair/Desk - Bookbasket - 17.5"
The unique design of this combo provides an exceptionally strong frame. The solid plastic top has the Ergo Edge and pencil groove. Chair height: 17.5"H. Specify colors. Evo seating captures a new look with a shell seat for proper posture and student support. Evo! 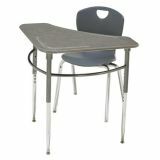 4 Leg Student Desk, 18" x 24"
The Evo! desk offers sleek style and superior strength at an affordable price to meet any budget. Top is made of high quality Ergo Edge solid plastic and polypropylene book box features renewable and sustainable wheat chaff - a CDF exclusive. Top size: 18" x 24". Adjustable height: 22" - 29". Evo! Cantilever Desk, 19" x 25.5"
The Evo! cantilever desk completes modern classrooms with its striking contemporary design. Convenient open sided access makes this model ideal for high schools and higher education environments. Features the exclusive CDF interchangeable glide. Top size: 19" x 25.5". 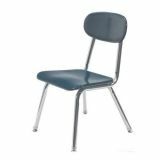 Our best selling solid plastic chair! Comfortable seating in a classic design. Proven parallel heavy-duty frame tubing ensures superior strength. Nylon, steel and felt glides. 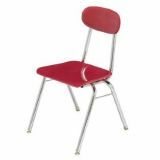 Our best selling solid plastic chair. Comfortable seating in a classic design. 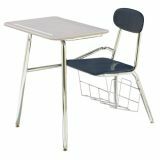 Proven parallel heavy-duty frame tubing ensures superior strength, and it is a true stack chair. Nylon, Steel and Felt Glides. Solid plastic. The popular triangle work surface design supports right or left-handed users while offering an educational platform designed for dynamic collaboration. 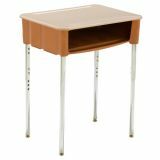 Durable, stain-resistant top is 27.5" x 27.5" and made of 3/4" thick solid plastic. Curved cross brace is welded to all three legs and frame is painted. Legs are 16 gauge steel and adjust from 23" to 32" high. Wheelchair accessible.